For as long as I can remember, my mom has wrapped our gifts in fabric bags. 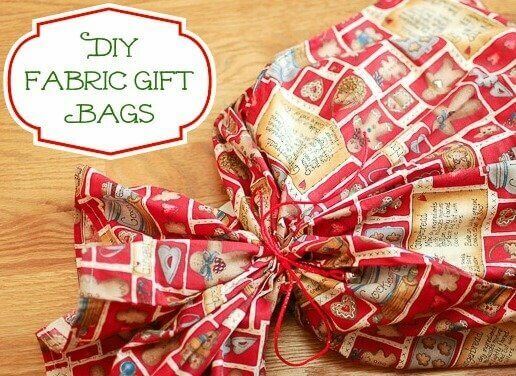 I have such fond memories of seeing all the pretty fabric bags under the tree Christmas morning. 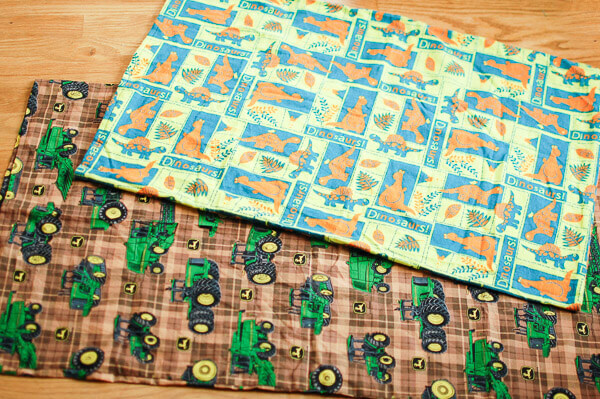 When I had my first child I thought it would be nice to carry on the special tradition, so I made a bunch of fabric bags … then a couple years later I made a bunch more … then a bunch more … you get the idea. Besides being sentimental, I love this idea because there is no waste. You can use them over and over again. If you would like to give it a go, I have included my how to below. Here is my disclaimer though … I am not a seamstress at all! I basically just know how to turn my sewing machine on and sew a straight line … luckily that is all you need for this! There are no exact measurements that the bags need to be … you can make them as big as you would like or as small as you would like. I like to make larger sizes for those big and awkward sized toys and smaller ones for DVDs and little gifts. 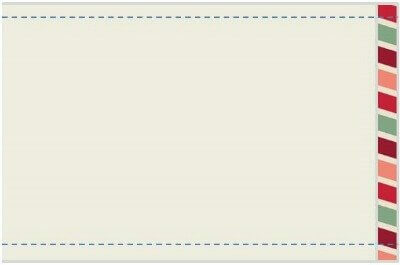 The instruction below will show you the basic idea for any size but for simplicity’s sake I will use a 17-in. × 17-in. bag as my example because then you can get two nice size gift bags out of a yard of fabric. Cut your yard into two 36 × 18 in. pieces. Set one aside for later. With the wrong side of the fabric facing you, turn down each end about ¼ in. and sew across. Then fold your fabric in half with right sides facing together and sew up each side. Keep the shorter edge open. 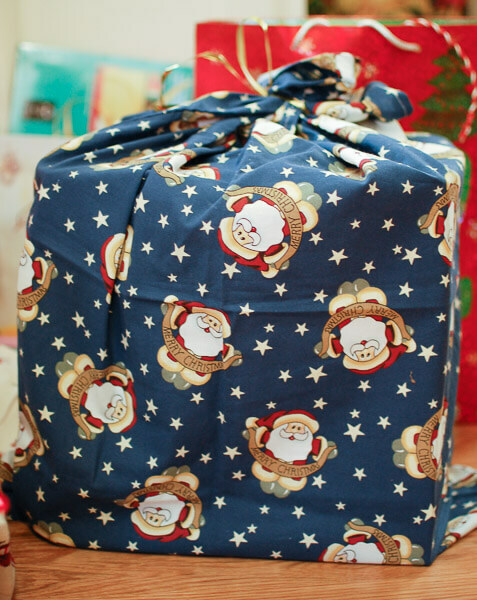 Now turn it inside right, fill it with your gift, and use a length of pretty ribbon or twine to close it up! 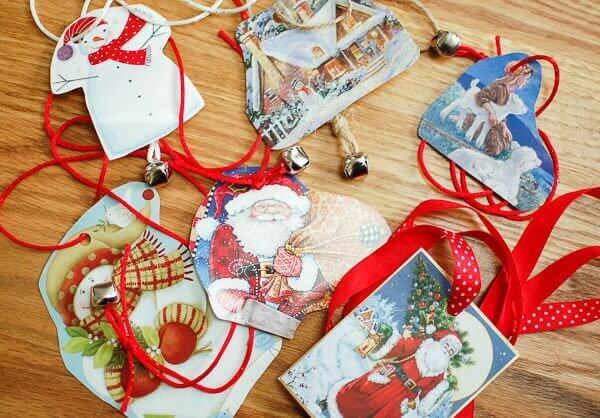 And if you want to keep going with this no waste, reusable theme, why not make tags from old holiday cards. I just add the kids names to the back and use them year after year. What a coincidence; I just made a dozen cloth gift bags yesterday afternoon and tonight. I liked having the ironing board and rotary cutter out . . . made it a lot faster and neater. 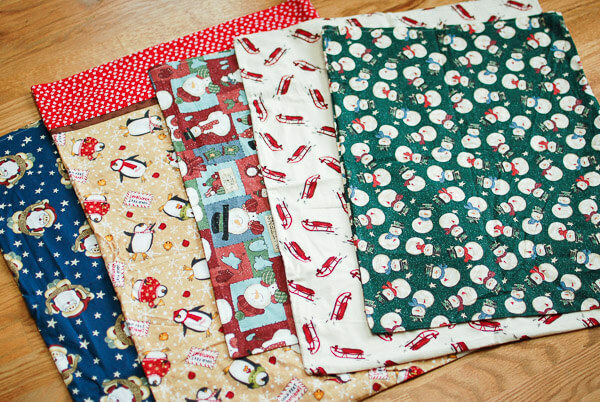 After Christmas I went to two fabric stores, and remnants were 1/2 price at one store and 75% off at another. I did French seams and tacked a piece of coordinating grosgrain ribbon about 2 to 3″ from the top of the bag to use as a tie. I had thought about doing mitered corners but decided just to poke the corners back inside. 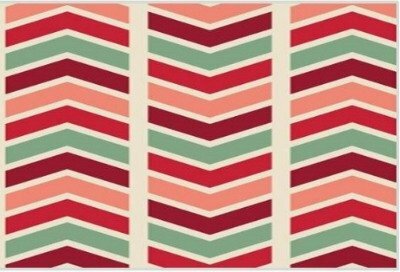 I noticed that the fabric store has holiday fabrics for 70% off, so I’m off to the store tomorrow at lunch to get some more fabric! It’s cheaper than the remnant price and I can choose the length of the yardage! I will continue to look at the remnant bin throughout the year for birthday, floral, and children’s fabrics. great idea. i think i will borrow the idea.